Your home Audio/Video system can now be controlled through the same HAI Snap-Link software. The new version of Snap-Link when used in conjunction with its Home Theater Extender (HTX) will allow you to use your iPhone, iPad, or iPod Touch (iOS devices) as a remote control. Also available is the HAI’s HTX2 mobile designer software, a tool that allows you to customize the user interface of your remote control – the different devices. HAI said customer wanting access to the new Audio/Video remote control functionality would need to upgrade from Snap-Link Mobile for iPhone/iPad. 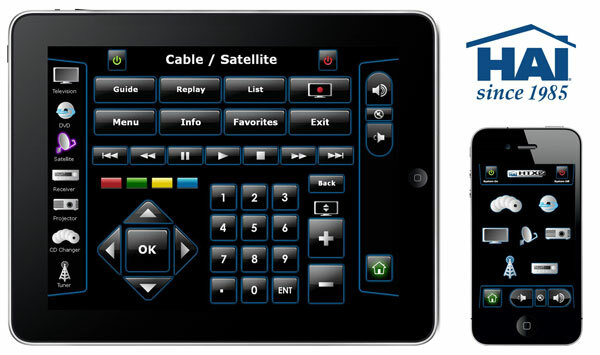 Interface designs for iOS devices can be modified using HAI’s HTX2 Mobile Designer software. HAI provides generic templates that can be customized for TV’s, DVD/Blu-Ray players, satellite/cable set-top boxes, projectors, A/V receivers, CD changers, and more. Advanced users can modify the provided templates, design their own templates, or purchase templates from third-parties. Users can even create macro buttons like “Play Movie” to activate a chain of commands, so that all of the applicable audio/video devices are set accordingly with the touch of one button. Audio/video devices can also be separated by room using PC Access so that when the homeowner selects the Living Room, they only gain access to the AV devices within that room. The HAI HTX2 may also be used with OmniTouch 5.7e Touchscreens. Customized A/V interfaces for HAI Touchscreens are developed using HAI’s Automation Studio, which is also used to configure the functionality of the HTX2.